We are entering the season of Advent, which precedes Christmas. It is the start of the liturgical year; Christ the King Sunday is the end of it. Christ the King (which we celebrated this past November 25th) recognizes our certainly that Jesus is Lord, now and in the future. The four Sundays of Advent acknowledge the complex reality of the promise of Jesus Christ in history. It remembers the prophets who predicted Jesus’ coming and the ministry of John the Baptist who heralded his arrival. It also celebrates that Jesus is coming again to reign: the word “Advent” means “coming.” All this of course precedes Christmas, the birth of Jesus: we are preparing ourselves for the coming of Jesus into the world, his incarnation—God coming among us as a human being to save us all. 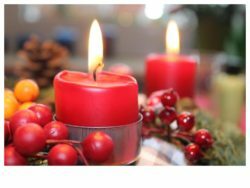 To appreciate more fully the meaning of Advent, the staff of St. Stephen invite you to our Advent luncheon presentations on the Wednesdays preceding Christmas, Dec. 5, 12, and 19, from noon until 1:00 pm in the narthex of the Sanctuary building. Dr. Ritsch will give the first presentation on the story of John the Baptist’s parents in the Book of Luke (and also in tradition), with lunch prepared by Roland Vogel and Jackque McCluskey. Beth Fultz, Director of Christian Education, and Jordan Smith, our Director of Music Ministries, will co-lead the next Wednesday; and Rev. Dr. Warner Bailey will present on the 19th. We hope you can join us for all three lunches! Because of the luncheons, Wednesday noon bible Study will be postponed and started again in January 2019.